Who Dares? by Krista Blakeney Bell. Review: Who Dares is a realistic fiction book, by Krista Blakeney Bell. The main characters are Toby and Rhys who are in middle school. Who Dares is a good book that teaches you valuable lessons. Toby and Rhys are off on an adventure, because of a dare. Rhys dares Toby to enter the Junior Surfing Competition, but he is better at tap dancing. In the end Toby ends up accepting the dare, but making a deal with Rhys for his benefits. Toby learns how to surf and Rhys learns not to keep his suspicions held within. They both experience true friendship not just with each other, but with an unexpected person, who they thought wasn't cool at first. Krista Blakeney Bell's book, Who Dares , is great for teaching teenagers about speaking up and not hiding any crimes or suspicions of crimes. Like Toby and Rhys thought at first that Brandon was a trouble maker and in fact he was hiding something. For example, this book taught me that if I think someone committed a crime or will I should tell an adult or the authorities. I encourage preteens or teens to learn these lessons and read Who Dares . The book tells you that people can overcome their differences and become friends and no longer enemies. Review written by Caitlin (7th grade student). 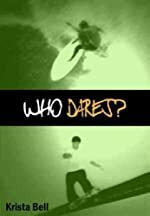 We would like to thank Kane Miller for providing a copy of Who Dares? for this review. Have you read Who Dares?? How would you rate it?